Dark Hall Mansion is celebrating Valentine's Day 2015 with a set of eye-catching prints featuring the Peanuts gang, going on sale this Friday, January 30. 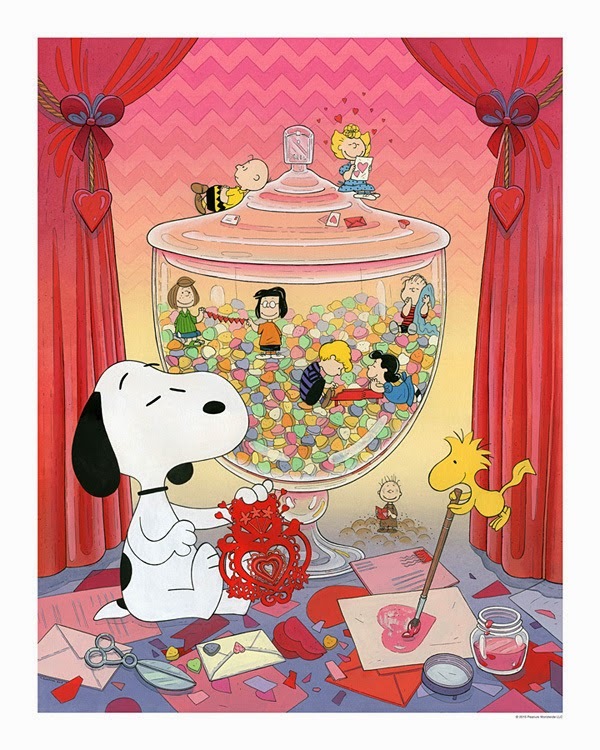 The very colorful prints by new-to-the-line artist Nicole Gustafsson, titled "Snoopy Valentine," are inspired by the TV special Be My Valentine, Charlie Brown and one of Charles Schulz's enduring themes of the comic strip - the joys and difficulties of love. The print is available in four editions: a standard edition; a variant edition with a different color scheme; and very limited canvas editions of each. The officially licensed glicée prints measure 16" x 20" and will ship in time for Valentine's Day. The standard edition will be limited to 280 prints, the variant edition will be limited to 50 prints, and the canvas editions limited to just 5 prints of each color scheme. The 2015 "Snoopy Valentine" prints go on sale Friday, January 30, 2015 at 9:30 AM Pacific time at Dark Hall Mansion's webstore. Visit Dark Hall Mansion's Facebook page and their blog for more information, larger pictures of the artwork, and behind-the-scenes photos.